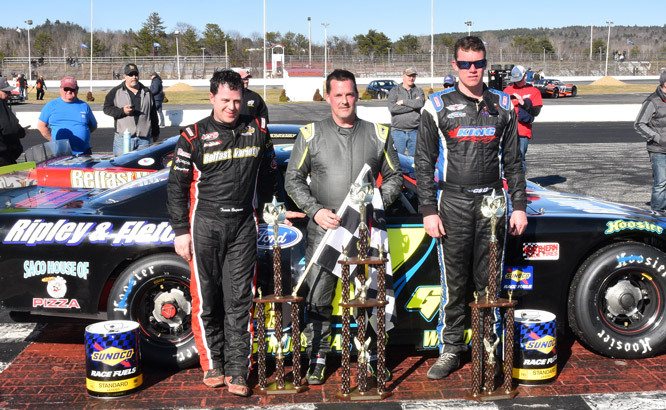 Oxford, Maine - Curtis Gerry of Waterboro continued to shine when the money is on the line, claiming victory in the Honey Badger 150 Pro All Stars Series Super Late Model race Sunday afternoon at Oxford Plains Speedway. 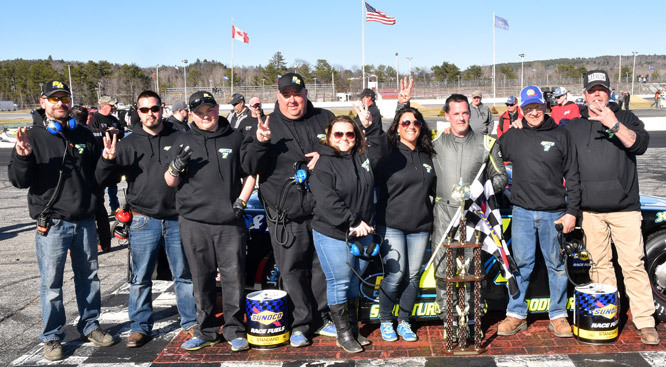 It was the third straight PASS Super Late Model win for Gerry at Oxford Plains Speedway, a streak that began at the 44th Annual Oxford 250 last August. Gerry needed to mount an impressive, late-race charge in the race, which ended with a green flag stretch well in excess of 100 laps, to get by Cassius Clark of Farmington. Clark led more than 100 laps aboard the Nova Scotia-based King Racing 13 before yielding to Gerry with just four laps remaining in the 150-lap test. 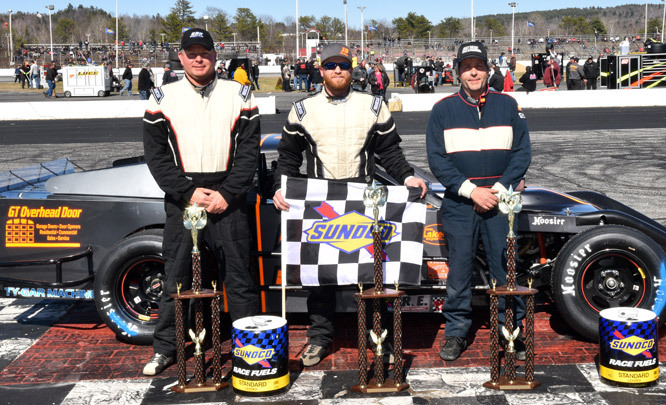 Clark, who won the 50-lap Budweiser Championship Series season opener on the previous night at Oxford Plains Speedway, easily held on to claim runner-up honors. Reigning PASS North Super Late Model champion Travis Benjamin of Belfast was an early leader in the race, earning a third-place finish at the checkered flag. DJ Shaw of Center Conway, New Hampshire and Strong's Tracy Gordon were the final two racers able to complete all 150 laps, finishing fourth and fifth, respectively. One lap off the pace and rounding out the top ten were Joey Polewarczyk, Jr., Garrett Hall, Scott McDaniel, Derek Griffith and Jeff White. Nick Sweet of Barre, Vermont also led the race, and turned in the fastest lap of the race. Defending PASS Mods champion Ben Tinker of New Gloucester prevailed in the first race of the season for the Northeast's only Pro All Stars Series-sanctioned open wheel racing class. Tinker's competition has stepped it up a bit after his dominant 2017 campaign, as runner-up Gary Shackford of Center Conway, New Hampshire was in contention for the victory. Perhaps the biggest test for the winner was provided by third-place finisher Bruce Helmuth of Wales, who led almost half of the 40-lap race before Tinker took command. Freeport's Jariet Harrison ended up in fourth position after racing with the leaders throughout the event. Second-year PASS Mod racer Patrick Sullivan rounded out the top-five rundown. Tyler King of Livermore Falls dominated the 40-lap special event for the Allen's Coffee Flavored Brandy Street Stock division. King won his heat race and started from the pole position in the main event and led every lap. It was his second straight win in the class. Matt Dufault of Turner was the best of the rest, outgunning Lyman's Gary Babinueau in the battle for runner-up honors. Cole Watson of Naples rebounded from a first-lap spin to finish in fourth position, followed by Green's Andrew Breton. 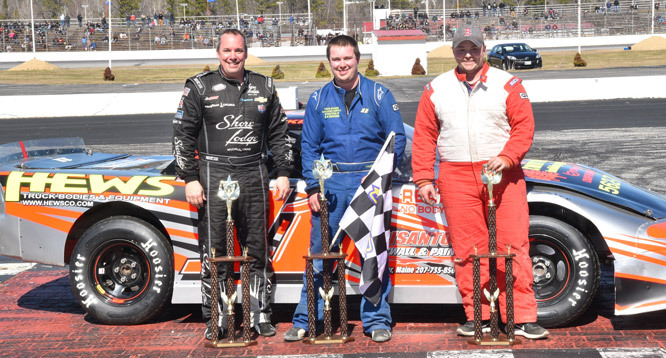 The next Pro All Stars Series North Super Late Model race is scheduled for Saturday, April 28 at Beech Ridge Motor Speedway in Scarborough, Maine. PASS Mods will also be contested. Post time is 3:00 p.m. For more information visit proallstarsseries.com or call (207) 539-8865. PASS Mods (40 laps) 1 19 Ben Tinker, New Gloucester; 2 60 Gary Shackford, Center Conway, NH; 3 25 Bruce Helmuth, Wales; 4 85 Jariet Harrison, Freeport; 5 16 Patrick Sullivan, Poland; 6 28 Mark Lundblad, Jr., Albany, NH; 7 2 Randy Sanborn, West Baldwin; 8 10 Kate Re, Lovell; 9 48 Brian Treadwell, Hancock; 10 64 Matty Sanborn, Windham; 11 14 Mike Napolitano, North Yarmouth; 12 27 Josh Hedges, New Bedford, MA. Allen's Coffee Flavored Brandy Street Stocks (40 laps) 1 11 Tyler King, Livermore; 2 61 Matt Dufault, Turner; 3 2 Gary Babineau, Lyman; 4 45 Cole Watson, Naples; 5 33 Andrew Breton, Greene; 6 52 Mike Nichols, Livermore Falls; 7 74 Rick Thompson, Naples; 8 85 Kenny Harrison, Freeport; 9 27 Patrick Thorne, Standish.